In this blog, we explain the differences between industrial stairs and commercial stairs, along with their related safety codes. The International Building Code (IBC) regulates any set of stairs used by the public, including any stairway that connects a building to a public space. These regulations must account for the safety of every type of person — including children and the elderly. According to the IBC, stairways with an occupant load of less than 50 people must be at least 36 inches wide. Stairs that are higher than 12 feet tall require an intermediate landing in the middle of the stairway. These landings should be the same width as the stairway and extend at least three feet in length. For open-sided walking surfaces like stairs and elevated platforms, handrails and guards are mandatory. And IBC-compliant stairs can’t have any gaps between those handrails or guards that could allow a four-inch sphere to pass through. This is to ensure a child’s head cannot pass through any section of the stairway, landing or platform. The IBC also dictates the rise and tread measurements for each individual step. Rise is the vertical height between any two adjacent steps and can be open (gap between the stairs) or closed (solid piece of material between stairs). The tread is the depth of the step itself. IBC-compliant stairs must have a closed riser between four and seven inches, and a tread of at least 11 inches deep. If your workplace is open to the public, then all stairways should adhere to these IBC guidelines. Many businesses have private facilities. Stairs in these environments are not for public use. They can include areas like factory floors and manufacturing spaces where only designated employees work. Therefore, they are not bound by the IBC. Instead, the Occupational Safety and Health Administration’s (OSHA) Fixed Industrial Stair regulations (1910.24) govern the design, construction and use of both interior and exterior stairs used to access equipment, machinery, tanks, elevated platforms, other floors or pits. All of ErectaStep’s stair systems (and all our products, for that matter) comply with industrial codes, and there are distinct features we build in to make them OSHA compliant. These types of stairs are used in industrial settings, so they must be strong. OSHA-compliant stairs are designed to carry a load five times greater than the anticipated load, but never less than a load of 1,000 pounds. Both handrails and guardrails must be capable of withstanding a minimum of 200 pounds of pressure applied from any direction at any point along the rails. Like the IBC, OSHA dictates specific measurements. OSHA stairs are required to be a minimum of 22 inches wide. Rise and tread measurements are dictated by the angle of the stairway rise. For example, stairs manufactured with a 45-degree stairway rise must have a minimum rise and tread of 8.75 inches each. Risers for OSHA stairs are allowed to be open. Handrails and guardrails are mandatory, but gaps are allowed between rails since children will not be using these types of stairs. Adhering to these regulations not only keeps you OSHA compliant, but also keeps your workers safe and productive. 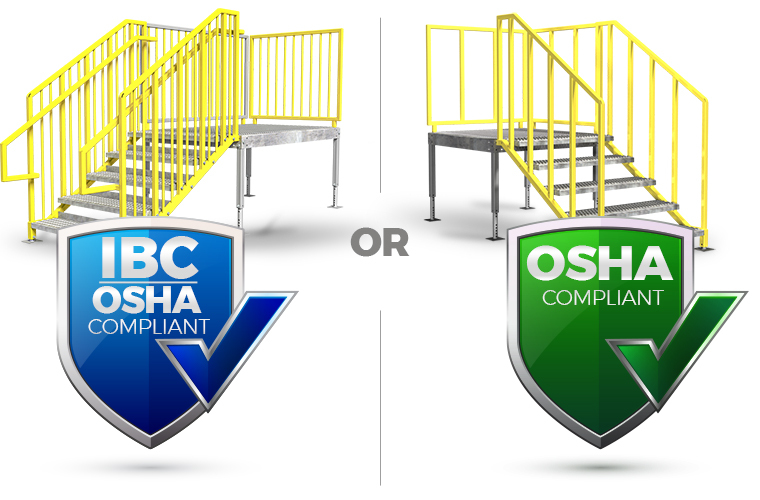 However, if both IBC stairs and OSHA stairs keep employees safe, how do you decide which option is the best for your business? Larger IBC measurements mean these stairs have a bigger footprint than OSHA stairs. As a business, you want the most value out of your facility’s limited space, so it pays to invest in equipment that requires less square footage. On the flip side, take ErectaStep’s stair system, which is fully compliant with OSHA’s codes. To access that same 12-foot platform with these stairs would require just 16 steps (9 inch rise, 9 inch tread), meaning the horizontal run would only be 12 feet long. Factoring in ErectaStep’s 26-inch width gives you a solution that uses 26 square feet of floor space — which is less than half the space required by an IBC stair to access the same platform. 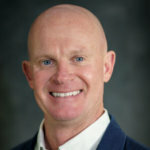 Another key difference is cost. 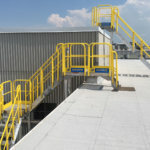 It takes less material to construct OSHA stairs since IBC stairs require closed risers and no gaps larger than four inches between handrails and guards. 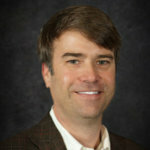 As long as the public does not have access to your equipment, an OSHA-compliant solution can save you thousands. ErectaStep’s OSHA-compliant solutions require less space, cost less and are completely customizable. The five components can be assembled in infinite ways, allowing you the flexibility to select a safety solution that will work best in your facility. We can even customize individual measurements, like rise and tread, with our PerfectaStep solutions, giving you the perfect configuration for your jobsite. Regardless of the stair type you’re looking for, be sure you speak with your vendor early about code compliance and what’s needed for your work environment.